Welcome to our “Wednesday Week in Reviews” series, where we take a look at some of the reviews current and former truck driving students are leaving us. We appreciate any and all feedback, as we strive to provide our students with the best experience possible. We’ve come a long way in 25 years of existence, and because of the feedback we receive, we’ve been able to develop our process into what it is today. Needless to say, the results and reviews speak to the kind of success the program has. 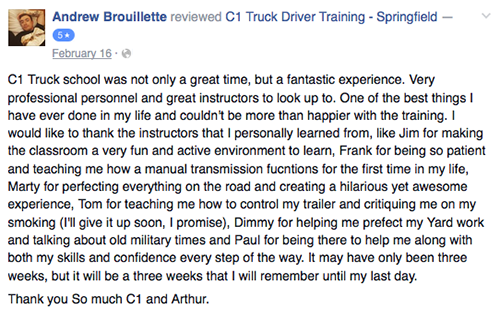 These reviews are from just one of our various truck driving school locations across the United States. We partner with only the best schools to make sure you get the training and experience you need to become a successful truck driver. Make sure to keep checking back in, we'll be back next Wednesday with more reviews!